Last year my oldest daughter and I saw this Glitter Heart Art Tutorial (video on the bottom of this post – Scroll down to watch 😉 ) from The Girls With Glasses and LOVED it. Seriously, so cute! My only problem is that I couldn’t stop thinking of where would I store this bad boy the rest of the year. AND since I am lacking any awesome mantels or areas like they used, I just pictured glitter all over my couch from my kiddos constantly touching it. Then last week I was scrolling through family pictures and remembered I had these fake petals from my daughter’s 3 month photoshoot I did at home. I let my daughter chose if we did a large heart or the word “LOVE” and she chose to go for love. I think it turned out really cute! And it was one of those a super simple, yet gratifying projects. We love a little more holiday love in our house! White background (we used the backside of wrapping paper to make our white board compltely white) – You can also use sheets of card stock if the lines between sheets don’t bother you. Step 2: Prep your background if necessary. We happened to have a gigantic frame and the almost white back of some old pictures from our wedding (you can see them on the wall here). I used the wrapping paper to protect the picture and then to make it extra white we resorted to sheets of card stock to line the backgorund. You can honestly barely tell they are there once it is up. I originally bought a large sheet of white board that you would use for a school presentation that was less than $3, but didn’t realize how big our frame was. So we upgraded to the old wedding pic. Step 3: Decide on your design and layout the letters or shapes that will be furthest apart with the petals. We decided on the word LOVE, so we did the line of the “L” and the “E” (with no glue dots). Once we were certain where we wanted them, we did the same with the heart (in place of the “O”) and the “V”. Then we used the glue dots to start sticking the petals in place used the stickers to layout. Step 4: Attach the finished Love board into the frame and secure it. Step 5: Hang on wall and enjoy! As hokey as it may seem, I really like it and my 8 year old daughter who was my main help is so excited that we have some real decorations on the wall and that they are BIG. I am also glad it will be a cinch to take down and there is no storage for next year! If we want it again, we can always recreate it! 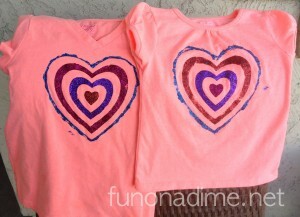 Do you have any fun Valentine’s Day Art Projects? Share them in the comments below. I would love to see them!